Kazakhstan’s estimated total petroleum and other liquids production was 1.77 million barrels per day (b/d) in 2017. 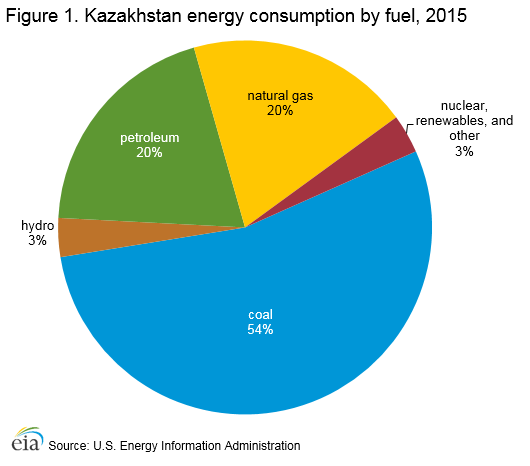 Kazakhstan consumed 2.59 quadrillion British thermal units (Btu) of energy in 2015, and coal accounted for the largest share of energy consumed (54%), followed by petroleum and natural gas (20% and 19%, respectively) (Figure 1). 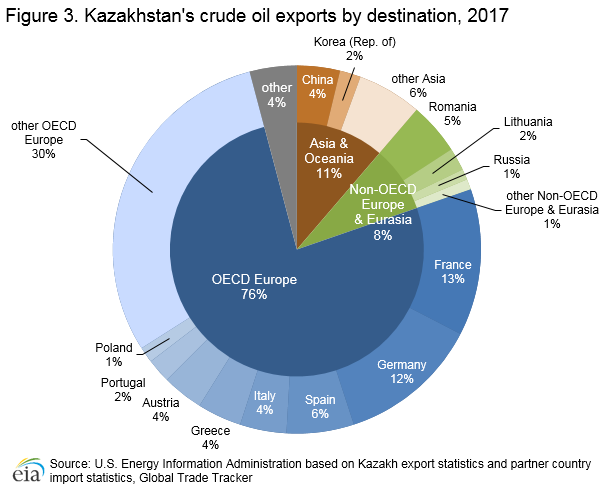 In 2017, Kazakhstan exported about 1.3 million b/d of crude oil and condensate, according to EIA estimates based on data from Global Trade Tracker and ClipperData (Figure 3). Most of Kazakhstan’s crude oil exports travel around or across the Caspian Sea to European markets. Annual gross natural gas production almost doubled from 2006 to 2016, from 0.9 Tcf in 2006 to 1.6 Tcf in 2016. In 2017, the Kashagan field became a significant producer of Kazakh natural gas. 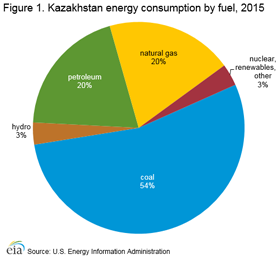 That year, the Karachaganak, Kashagan, and Tengiz fields combined accounted for about 65% of Kazakhstan’s commercial natural gas production. In response to stakeholder feedback, the U.S. Energy Information Administration has revised the format of the Country Analysis Briefs. As of December 2018, updated briefs are available in two complementary formats: the Country Analysis Executive Summary provides an overview of recent developments in a country's energy sector and the Background Reference provides historical context. Archived versions will remain available in the original format. Data presented in the text are the most recent available as of January 7, 2019. Oil & Gas Journal, “Worldwide look at reserves and production,” p. 20 (December 4, 2017). Energy Intelligence, Nefte Compass, “Kazakh Crude Oil and Gas Condensate Production, 2017,” (January 25, 2018). Oil & Gas Journal, “Worldwide Refining,” (December 5, 2016). Energy Intelligence, Nefte Compass, “Kazakh Refinery to Launch Cat-Cracker,” (July 12, 2018), p. 8. EIA estimates based on crude export data reported by Kazakhstan and import data reported by trade partners from Global Trade Tracker, accessed August 28, 2018 (subscription) and crude tanker data from Clipper Data (subscription) accessed September 3, 2018. 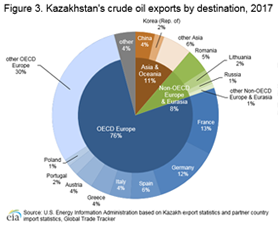 Note that other OECD Europe includes the difference in volumes reported by Kazakhstan versus those reported by OECD Europe countries that transit crude oil or have crude oil pipeline connections to countries that transit crude oil (Italy, Netherlands, Austria, Belgium, Czech Republic, and Germany). Kazakhstan Electricity Grid Operating Company KEGOC, Kazakhstan Electric Power Industry Key Factors, (accessed September 24, 2018).